Bingo Fabulous was first founded in 1997, making it one of the oldest bingo websites. The website is owned by the 888 Group, which is itself a market leader in the online games industry. The group has its headquarters in Gibraltar and is licensed by Cassava Enterprises Limited – 888 UK Limited is regulated by the Great Britain Gaming Commission. This information means that players can rest assured they are playing with a secure and trusted company. The software on the Bingo Fabulous website is operated by Dragonfish, a popular software for bingo websites. The use of such software ensures a familiar gaming experience for regular bingo players and the security of a well-known piece of software for players both new and old. Games on the Bingo Fabulous website are tested regularly to ensure that they are fair and give payouts which are honest. The website’s main priorities is to offer players privacy, security and fair gaming. Bingo Fabulous offers three types of bingo games. The traditional UK 90 ball game, the American 75 ball game and Bingo Fabulous’ own game – high five. There is also a range of instant win games available including slot and casino games in a variety of themes. Bingo Fabulous has a great offer for new players. If you deposit £10, you will get a 200% bonus and £5 free, meaning that you get £35 to play with. The minimum deposit amount is £5 but you will need to deposit £10 in order to qualify for the bonus. You should also note that there are terms and conditions relating to the bonus – if you win using the bingo bonus, you will need to wager four times the deposit (£10) and the bonus funds to withdraw your money, meaning that you would have to spend around £75 before you can claim your winnings. The more that you put in as your initial deposit, the better your bonus will be. The Maximum new player bonus amount that you can get is £100. Midnight Madness 2017 – Occurs at 23.59 on New Year’s Eve 2016, with the chance to win £2017. 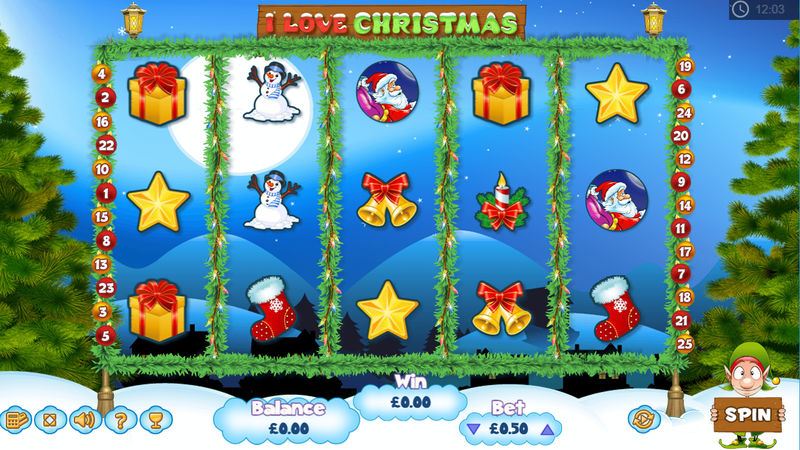 £4,000 prize draw when you spend on Christmas slot games. £50 and £100 jackpots every day during December. Late Night Show – £100 cash for invited players only. Monthly 2 million race – Win up to 2 million loyalty points. Sure Win – Occurs on the 1st and 15th of every month with a guaranteed win. It’s free to make a Bingo Fabulous account and you don’t need to make an initial deposit to set up an account. You will be asked to provide some basic information such as your name, address, email address and phone number. You’ll be asked whether you wish to receive promotional offers by email or SMS – you can opt out of both. Once you have provided all of the relevant information, your account is created and you can make a deposit if you wish to. 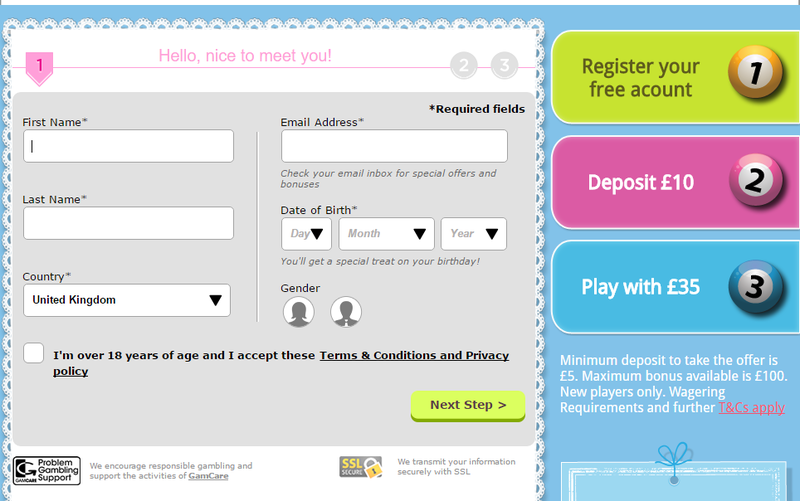 Alternatively, you can browse the site to see which games are available before you go ahead with making a deposit. 90 ball bingo is the most popular way to play in the UK. With 90 ball bingo, there are three chances to win – for a line, for two lines or by calling a full house. The line is the smallest prize and the full house is the largest – there may also be special prizes for claiming a full house in a certain amount of numbers being called. At Bingo Fabulous, 90 ball bingo is available in a variety of rooms. Players can play for free in the Quids In room – designed for new players with a maximum jackpot of £1. Other rooms include Sunny 90’s and Chatterbox. 75 ball bingo is a style of play which originated in the USA. 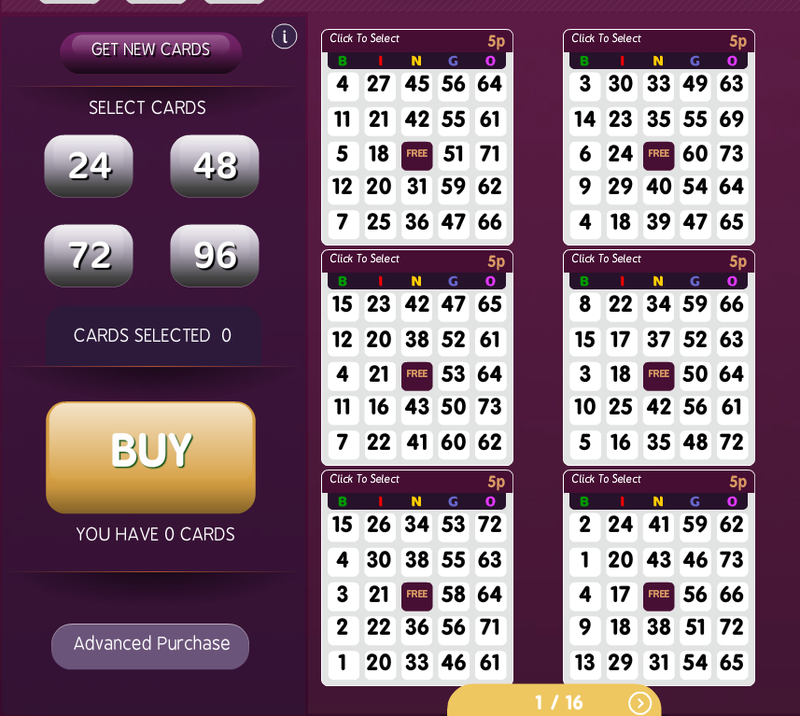 75 ball bingo only gives the player one chance to win – by forming a pattern using the numbers on their card. The pattern is usually double lines or a cross. Numbers are structured according to a BINGO layout – under the letter B are numbers 1-15, under the letter I are the numbers 16-30 and so on. There is a free space in the middle of the card which is automatically crossed off – players can use this to form their pattern. As there is only one chance to win, 75 ball prizes are usually larger than 90 ball. On Fabulous Bingo, a number of rooms offer a 75 ball style of play including Bingo Buddies, Rollercoaster and Big Fat 10. As well as bingo games, Bingo Fabulous offers a range of instant win games. The games on offer include slot games. The slot games all have different themes, from TV shows such as X Factor and Deal or No Deal, as well as Irish Luck, Wheel of Fortune and Piggy Payout. The variety of themes ensures that playing slot games cannot be repetitive. The stakes on slot games varies and some of them have fixed jackpots, whereas others have progressive jackpots – when someone doesn’t win, the jackpot is carried on. To instantly chat with an advisor, just log into your Bingo Fabulous account and go to the help room. If you wish to contact Bingo Fabulous via email, you can do so by emailing help@bingosupport.org – they hope to reply within 48 hours. For assistance over the phone with your Bingo Fabulous account, call 0800 901 2510. 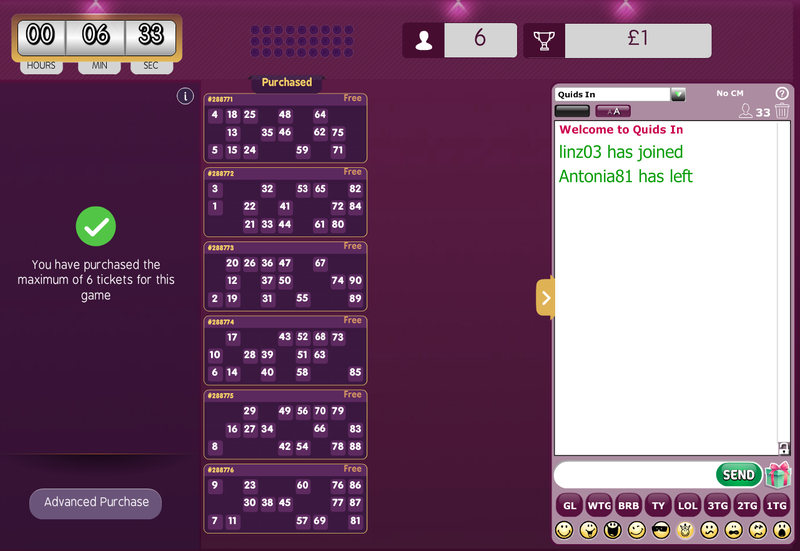 We think that Bingo Fabulous is a basic site, but the use of Dragonfish software keeps it easy and fun to use. There is a wide variety of rooms and slots available. The chat hosts regularly play chat games which are fun to get involved with. The one thing to watch out for is playing with a bonus as you might not be able to withdraw if you win without depositing a fair amount.